When playing with my scanner and photo editing software to find out how to get around the built-in law prohibiting to scan money, I looked at the dude on that one bill and could not help thinking about what he did to become so admired that he now is on one of those pieces of paper that is usually called money. Honest Abe managed to trample liberty with all his feet by forcing the south to remain in the union. They did not like to be in that union any more but Abe did not want to lose what they contributed so he waged a war to keep them in. As he was the victor he packaged his motives as “freeing the slaves” – but politicians, especially when victorious have always been very good at this kind of re-purposing. 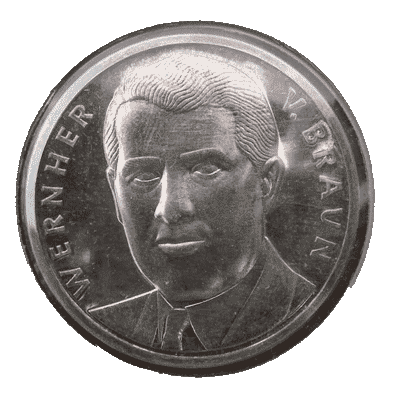 Wernher von Braun – the man who took us to the moon. But he also was a war criminal because he built – or helped build – all the V2s that were used to bomb England. He did not have to stand trial in Nuremberg because his services were needed in the US of A. So, what could I do to get my picture on some money or at least a coin? No good idea yet but maybe some of you might come up with something. And, so that you did not come here for nothing – here is how I got the picture of Abe from the 5 Dollar bill. My scanner – an HP – did scan the bill without a problem into a png file. I could not open that in Photoshop or Corel Paint – but Gimp was not so picky about the law. So I opened it there, cropped and straightened it, then selected all and hit the Crtl C.
In Photoshop I could open a new doc and just paste the data from Gimp. 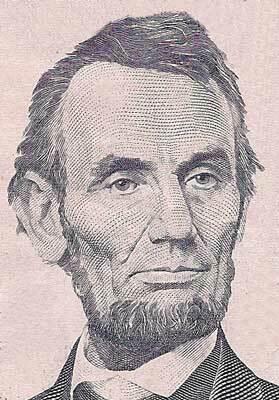 Once saved as a Photoshop native format – psd – there was no problem re-opening that file – and cutting out honest Abe. This entry was posted in Computer, Culture, History, Philosophical, Politics, Technology and tagged Abraham Lincoln, coins, corel paint, dollar bill, honest abe, Money, moon, motives, nurnberg, photo editing software, Politicians, scanner, slaves, v2s, von braun, Wernher von Braun on November 8, 2012 by Merlin Silk. This year, July has 5 Fridays, 5 Saturdays and 5 Sundays. This happens once every 823 years, which means we will most likely not see this again during our life time. It is called the money bag. According to the email that conveyed this information to me I will have to forward this to my friends and money will arrive within 4 days. This is supposed to be based on Chinese Feng Shui. The one who does not forward…..will be without money. This entry was posted in Philosophical, Snippets, Stories, Weird and tagged chinese feng shui, life time, Money on March 12, 2011 by Merlin Silk. If you would hear somebody announcing that very exictedly “You can save a full hundred bucks on your new Ford F150 truck!” The only thing to do is drive all across town to the dealer Joe Cheapcars and pick it up, you would probably not share this enthusiasm much. Hundred bucks on a car – that’s not much. But now take that miter saw that you alwasy wanted to have for your weekend projects. So far, at $150 it was not quite justifyable considering the number of weekend projects you actually do. But now James Toolshack over in Othertown just 30 miles across the river has it for only 50 bucks! So as soon as the weekend is here it off to the Toolshack to finally get that miter saw. We saved a full hundred bucks! So, what’s the difference between the hundred bucks save on the car and on the miter saw? Nothing as far as the money in the wallet is concerned. This entry was posted in Educational, Science, Video and tagged Cheapcars, Ford, Ford F150, Ford Truck, Insight, Miter Saw, Money, New Car, New Ford, Toolshack, Wallet, Weekend Projects on December 22, 2008 by Merlin Silk. If you don’t buy into the benevolence of governments and have looked into how this all might actually work, you probably ran into terms like fractional banking and the fact that the Federal Reserve is just as Federal as Federal Express – in other words, it’s private and by no means an agency of the government. This is only the first part but I am sure that you will be able to find the other parts easily if this first part was intriguing for you as it was for me. This entry was posted in Politics, Video and tagged Array, Benevolence, Federal Express, Federal Reserve, Fractional Banking, Governments, Monetary System, Money, Video Presentation on December 8, 2008 by Merlin Silk.